The sentiment is from My Pink Stamper's More Fabulous Phrases. Roberta, This is such a cute card. I really like that you cut the leaf from the polka dotted paper. The grapes look so yummy and the sentiment cannot be better. i love the sentiment. I love the colors of this card, Roberta. And the stamp sentiment is sweet. It came out great!! 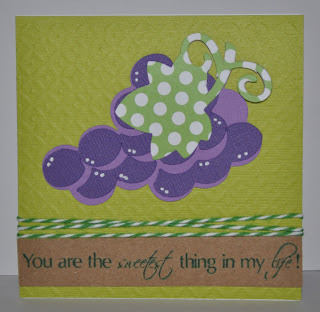 I love it, the grapes are adorable and I love the polka dotted paper for the vines/leaves! Oh yes I have a few of those I need to do use that I've never touched.....this is great, I love the embossing in the background & the colors really pop!! Cute card, Roberta! Welcome back, stranger . . . we've missed you!!! !